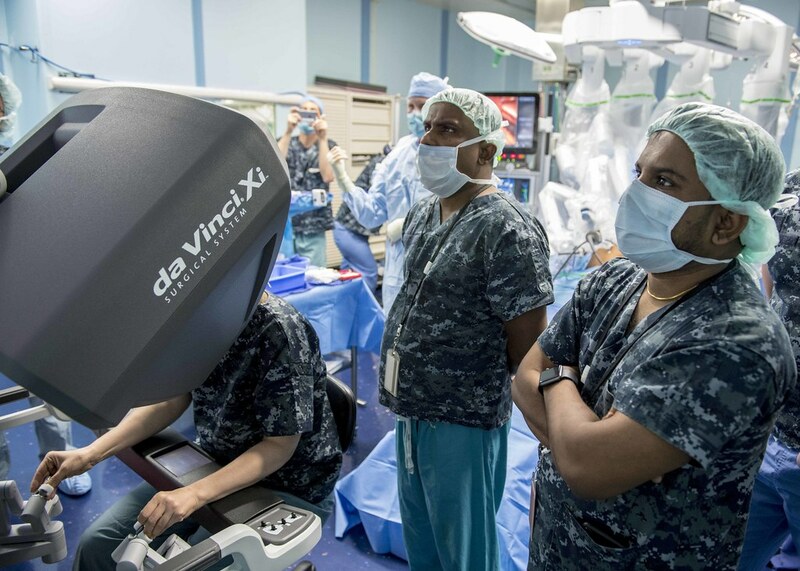 TRINCOMALEE, Sri Lanka - U.S and partner nation service members participating in Pacific Partnership 2018 (PP18) and Sri Lankan surgeons, assigned to Base Hospital Mutur, conducted the first ever robot-assisted surgery aboard Military Sealift Command hospital ship USNS Mercy (T-AH 19), May 4. Prior to the actual surgery on May 4, Gadbois along with Dr. Vyramuthu Varanitharan, a general surgeon at Base Hospital Mutur, and Cmdr. Tamara Worlton, a surgeon from Walter Reed National Military Medical Center assigned to Mercy for PP18, ran through simulation exercises using the Da Vinci XI Surgical System on a mock patient and finalized surgical plans as a team. On May 28, the team selected a patient who needed a cholecystectomy and was willing to have a robotic-assisted surgery performed. According to Worlton, all the preparation and collaboration put into planning before the operation paid off and the entire surgery was completed in a smooth and routine manner.